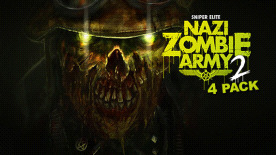 Includes four copies of Sniper Elite: Nazi Zombie Army 2 - Send the extra copies to your friends! © Copyright 2013 Rebellion. The Rebellion name and logo, the Nazi Zombie Army name and logo and the Sniper Elite name and logo are trademarks of Rebellion and may be registered trademarks in certain countries. All rights reserved.